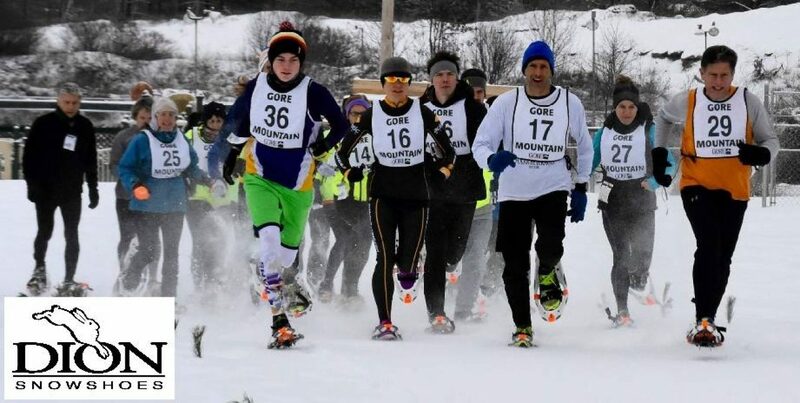 For anyone with a sense of humor, Bob Dion’s pre-race directions are a highlight of any snowshoe race. He didn’t fail us at the Hoot Toot and Whistle on Saturday. As the name implies, it is run on an old rail trail, adjacent to the West Branch of the Deerfield River, a lovely run through the trees with the river in sight next to you. Tranquil it may be, but if you listen to Bob, there are numerous ways you can muck it up. After the above “water crossing directions” Tim Van Orden pointed out that one such crossing involved a single piece of wood across the brook. He implored us all to be civil and patient in our attempts to cross. This was a veiled request not to barrel up the trail, bottlenecking at the crossing, and to avoid human carnage. Once the race started, we quickly crossed 3 ‘water hazards’, each time hearing racers saying, “this must be the brook he was talking about”, before we actually arrived at the true ‘water hazard.’ Now you could hear people’s fun comments….”Oh, so THIS is the crossing he was talking about. I thought it was the last one…’’ etc. Those are just a few of RD Bob’s very helpful pre-race instructions.